As part of the commemoration of the 50th anniversary of the Poor People’s Campaign, organizers are shedding light on the challenges faced by those who are most in need. Last week, EPI began our snapshot series to help readers understand the challenges surrounding poverty that remain today. We illustrated the progress made in reducing poverty since 1968, particularly among the elderly, and stressed that significant racial disparities remain. Today, we are taking a closer look at those who fall below the official poverty line. While in our last post, we focused on the elderly, who saw great improvements in poverty reduction over the last 50 years, and children, the age group with the highest poverty rates today, here we look specifically at adults 18–64 years old. The share of these non-elderly adults in poverty rose from 9.0 percent in 1968 to 11.6 percent in 2016. The figure below shows non-elderly adults in poverty segmented into various labor status categories. 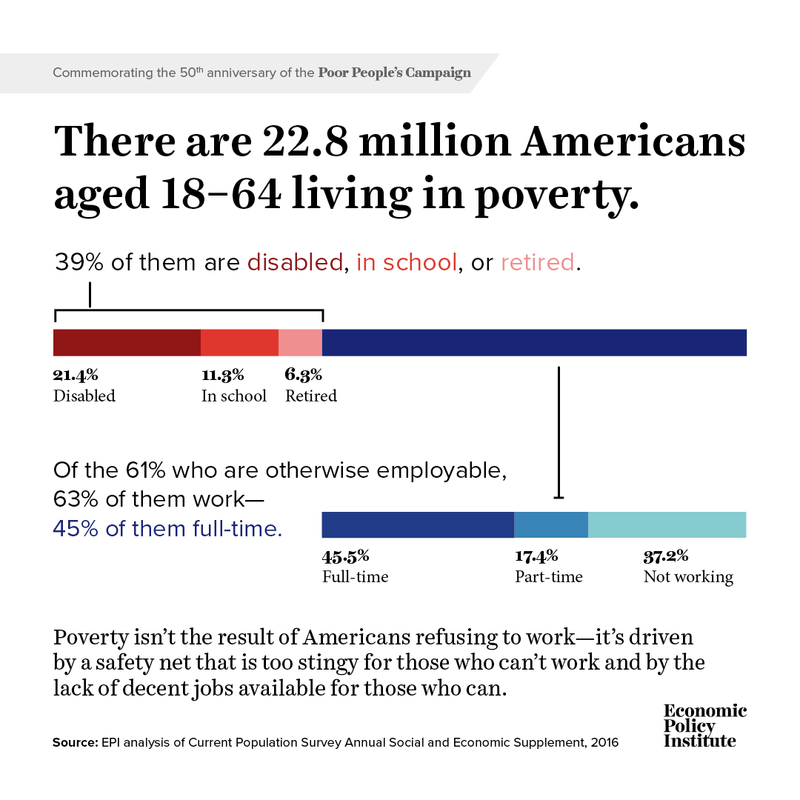 The top bar shows that 39 percent of those living below the poverty line between the ages of 18 and 64 in 2016 were not working because they are retired, going to school, or disabled. Clearly, an inadequate safety net is failing many who may be unable to work. The bottom bar shows us that, among those working-age individuals who are otherwise employable, 63 percent are working and 45.5 percent are working full time. An additional 37.2 percent are not working, but this share includes 1.6 million people living below the poverty line who are actively seeking a job. The data make it clear that millions of people who are active participants in the labor market are unable to make ends meet, either due to insufficient hours or low wages. Too often, it is assumed that poverty persists in the United States because those living below the poverty line simply refuse to work. In fact, a significant share of these individuals work and work full time, which means policies that boost employment and wages can be an important tool for reducing poverty. This does not eliminate, however, the need for a stronger safety net in this country to ensure that all people, regardless of whether they are enrolled in school, disabled, serve as full-time caregivers, or any other reason, are not vulnerable to falling into poverty. A serious fight against poverty requires both a more generous safety net and a better-functioning labor market.